‘My preference for poetry is to find the fewest words to say the biggest thing. To carve it down until you’ve got something that evokes a much bigger world and opens it up rather than closes it,’ says poet, Katie Keys. True to her preference, Keys’ poems are tiny (less than 140 characters). She harnesses the new media galaxy by publishing a poem daily via the Twitter handle @tinylittlepoems. New media is to poetry as it is to long form: a medium that has both disrupted traditional channels and provided new ones. ‘I’m a big advocate of Twitter in particular as an amazing creative catalyst for poetry,’ says Keys. Twitter's brevity promotes the clarity and distillation of language she likes to read in poetry. But another big part of Twitter’s appeal is that it often reaches people who might not buy a poetry book. If you want to be a writer, find an opening in your schedule to write. Thanks to Rupert Ganzer (loop_oh) for use of this image Open lock box at the Senckenberg Museum in Frankfurt am Main / Germany under Creative Commons. ‘Poetry is still (unfortunately) fighting off the bias of being an elite impenetrable art form. The general populace is still recovering from poetry as an idea of something you learn by rote, that is not enjoyable, not for them and not accessible,’ she says. Twitter provides a mechanism for Keys to talk to others about poetry. ‘I spoke to a guy recently who said, “I’m still struggling with it, but you’ve made me think about poetry as something that doesn’t rhyme,” Well great! I’m excited by that,’ she says. The conversational aspect of Twitter has also helped Keys with her professional development. ‘You get automatic feedback on what’s working and what isn’t. I very rarely get direct critique – but I can see from the number of retweets or favourites which ones are stronger. Over four years that’s helped me hone and develop,’ she says. In addition, publishing poetry via Twitter has lead to Keys’ participation in conferences and events where she works as a poet in residence. At a recent event in Alice Springs she busted out 170 tweets in four days! (And next week she’ll be poet in residence at Melbourne’s Art Centre). Over time Keys has adjusted not only to Twitter’s size limitations but also to the discipline of publishing daily. ‘I’m a compulsive editor. I had to let go of that in order just to push it out, to be writing everyday and to meet my own deadlines,’ she says. She writes most of her tiny little poems in long hand first – scribbling, crossing out and editing. Like all of us, she has good days and bad. ‘[Before I was a writer] I spent a lot of time and energy getting upset at myself for not doing what I know I love to do: I neglected my writing,’ says Keys. Ahead of starting @tinylittlepoems Keys often told herself she was too busy to write. (Yet she noticed increased productivity when she set her own arbitrary deadlines – such as that for NaNoWriMo!) One day she stopped making excuses and set herself the task of writing and publishing a poem to Twitter every day. This was clearly a turning point in her writing career and something she encourages for all writers. From July 27 to August 2 Katie Keys will be the poet in residence at Arts Centre Melbourne, she’ll be sending tiny little poems via Twitter as well as the Arts Centre’s LED signage. New media technology empowers writers to avail their work to billions of readers and tap new sources of income. Well… in theory anyhow. The truth is it’s difficult to reach readers and get an income. If you simply publish they will not come. For any chance of readers (and returns) you’ll have to do some marketing too. But how does a lone writer with no marketing budget promote their new e-book? The common advice in writing communities includes sharing via social media, getting reviews and getting yourself and your work profiled on traditional media. These are all good strategies. But it isn’t until I put the question to someone outside of the writing community that I realise there are good ways and bad ways to apply these. Tim O’Neill, Joint Managing Director of digital agency Reactive, AIMIA National President (and, full disclosure, my old boss) draws a useful parallel between marketing e-books and marketing apps. Promoting on a budget? Harness your marketing efforts into one big bang, says Tim O'Neill. Thanks to continis for use of this image, Fireworks, under Creative Commons. Concentration is at the core of app marketing. ‘You want to get a real peak of downloads in one go so that it flies up the charts because you get noticed,’ says O’Neill. Getting noticed means the opportunity to be featured on New and Noteworthy charts – places that app buyers (and e-book readers) regularly frequent. A concentration of marketing activity can also help get your work into the zeitgeist. If people are exposed to your message via different sources they may soon become curious and download or discuss it themselves. This is another component of app marketing: ‘trending’, which can be carried over to e-books. ‘The easiest way to get trending is to get all that attention bundled as opposed to drip-feeding it over time,’ says O’Neill. He calls it the big bang theory of marketing. ‘The big bang theory of marketing is to work out what you can do and do it all at once. You spend all your media in one big go,’ he says. Concentrating all of your marketing activity to a single day or a single week is the difference between standing in a crowd lighting little sparklers one-by-one or blasting your message above that crowd through a single firework. Writers with no ‘marketing spend’ will need to gather their gunpowder nimbly. ‘Part of marketing your e-book would be having the book [or information about it] in as many free places as possible,’ O’Neill says. He cites slideshare.net as one example. Free sites like this give you a chance to be discovered. ‘Especially if you do the meta tagging and descriptions correctly,’ says O’Neill. Consider also who can promote on your behalf. Taking the example of my recent fundraiser, O’Neill suggested asking the Red Cross to promote it or retweet about it. Asking for retweets is particularly easy, ‘It’s definitely an appropriate way to go about promotion because you’re asking someone to do something in the medium,’ says O’Neill. (Do a logic test first however, because it needs to make sense that this person or organisation would retweet). Calling on friends and family for their pyrotechnic assistance will also help. ‘It’s getting other people to amplify it for you rather than you having to do all the work,’ O’Neill says. As a professional digital expert O’Neill knows the value that search engines can bring. ‘Search is definitely going to play a role and search optimisation should play a big role if you don't have a media budget,’ says O’Neill. First decide on a page or domain where you will concentrate all of your marketing efforts (for example mine is pepironalds.com/help-japan). Then use search optimisation techniques to get that page ranking highly on search engines like Google (this is a complex venture, so I won’t try to explain it here: try this PDF instead ). You may even want to invest in a paid campaign (but take care to set it up correctly as these ads can cost more than your royalties). ‘In the product development phase app developers will ask things like who the audience is and whether there is a need and a demand for it. If there’s no immediate need or demand they ask how they will create that demand,’ says O’Neill. These are the kinds of questions that will define the avenues on which you market your e-book. What’s it about? Who would like to read it? Who needs to read it? The trick to big-bang marketing is preparing all of this information in advance, making the contacts and setting up the day, or week for all of the marketing to happen. As with handling explosives you will need to take particular care and concentration. But this might be the difference between a blast of sales or a disappointing implosion. There’s a slight reflection on the bookstore window. In it I can see the streetscape - pedestrians, a café and a tree behind me. But I ignore the reflection and peer into the store. Hundreds of books sit on shelves and tables and in potential buyers’ hands. These books have made it. They’ve been written, edited, designed, published and now put on the shelves of a bookstore. The work has been done, right? ‘Why is it that some books are the books that everyone talks about and everyone reads, while other books just languish?’ asks Beth Driscoll, Lecturer in Publishing and Communications at the University of Melbourne. It’s a question we all ponder, and one that Driscoll is particularly interested in. She’s curious about the place books have in society: what they do, how they work and how they circulate. Looking at literary culture (all of it). Thanks to Pat M2007 for use of this photo Decisions, Decisions! under Creative Commons. We’re not just talking about the work of writers and editors. Or even the work of designers and publicists. We’re also talking about the literary milieu: reviews, reviewers, adaptations for TV or film, university reading lists, book clubs, prizes and festivals. ‘I like to look for patterns that emerge from that – from the interactions between different people in the [wider] field,’ Driscoll says. So what are the patterns she’s seen so far? Driscoll and I are sitting in a café next to the bookshop and I become more aware of her point. A writer’s journey doesn’t start in a publishing deal, a good cover design, a good review and nor does it start on a bookstore shelf. It starts when readers engage with your words, when they suggest your work for a book club, or talk about it over coffee. I see this literary zeitgeist at work around me daily: people reading in cafes, people reading reviews, people – like us – talking books. But how does this manifest in the digital space – particularly for digital-first publications? ‘I care about readers and how they respond to events in literary culture,’ Driscoll tells me. As I pass the bookstore again on my way from our meeting I realise that I do too. 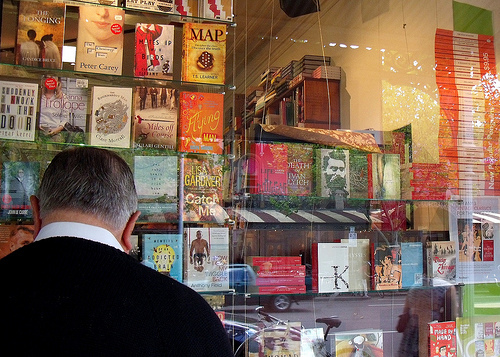 The reflection on the bookstore window is as important as the books within. ‘Creators of new work, [are] not just vying for attention with everybody else who’s creating new things, we’re vying for attention with the entirety of human history,’ says Groth. All of this data, ‘makes the future of books and all creative endeavours an incredibly noisy place.’ One of the biggest challenges for writers (and our readers) is how we navigate this. Writers tend to get attached to the idea of print because we’re yet to establish ‘any consensus or rules … of finding out what’s worthy, what gets passed down and what becomes part of the wider culture when it’s emerged from [a digital] environment,’ Groth says. We’re still using ‘old systems’: the book is a symbol of recognition because it’s understood that certain processes of approval are required before print. (For example a blog can be defined as successful because it’s made into a book). ‘In that process we’re conferring some kind of cultural importance to it,’ says Groth. It’s an interesting concept, and it makes the challenge of establishing a career in writing all the more daunting. However Groth says becoming successful these days is, ‘just as mysterious as it always was. The more engaged you get with people in publishing (people who’ve come from the old models) [the more you understand] that no one really knew what would be successful. It was all based on instinct.’ Digital media may disrupt the playing field, but the notion of instinct still applies to the work of emerging writers. And for some of these writers, the digital environment may even be better. In a sea-blue auditorium at Sydney’s Maritime Museum, a series of panelists and keynote speakers took me on a voyage through the Future of Digital Publishing. It was a trip into the murky depths as these panelists are all experimenting in a very new, but surging tide of technology. Convergence was the theme, but contradictory views swam across it, showing how the readers (or audiences) are now the ones controlling the rudder. I was at a seminar (the Future of Digital Publishing), organised by the Australian Interactive Media Industry Association (AIMIA) and Publishers Australia. I saw it in Sydney, but the event will also be held in Melbourne on Tuesday, 21 August. (Full disclosure: I went on media pass). If there’s one certain thing about the future of digital publishing it’s that nothing much is certain anymore. On the up side, our readers are still out there (somewhere) bobbing in little dinghies of their own choosing. They’re less interested in consuming broadcasts pitched to audiences of titanic proportions (that model is sinking). Different readers (sorry, *audiences*) want different things. In these visions of the future, words alone are not enough. At the seminar, keynote speakers and panelists gave a range of perspectives. They debated pricing, business models, interactivity, skills sets and technology platforms. They agreed on one thing: print is not dead, but print alone is dead. I guess I’m still an idealistic romantic when it comes to my writing. I can’t help but associate the word ‘product’ with mass-produced consumer goods - likewise ‘business models’ with economic rationalism. I take a lump of neither with my conception of writing and literature. But I do know the basics of how markets work, and I realise that if writers, editors and publishers want to earn from our crafts, we need to rethink our delivery and pricing models. ‘Reimaging the magazine’ was at the centre of science-focused Cosmos magazine’s move toward an iPad version. Cosmos netted benefits from paddling out behind the technology breakwaters. The editorial team (lead by Editor in Chief and keynote presenter Wilson da Silva) studied the marketplace first. They listed their likes and dislikes before they moved into digital. They learned from the efforts of pioneers like Sarno, scavenging good ideas and throwing out bad ones. Cosomos’ iPad publication has interactivity and bonus content. And in a nice twist for long form writers, da Silva says it has encouraged Cosmos to publish longer pieces. Rebecca Haagsma, Director of Product Innovation at Mi9 (a part of ninemsn) spoke of the importance of making connections with your audience. Haagsma gave her five top tips to ‘make your audience really feel something’. They included: ‘The reverse’ (any story that tells the reverse of what you expect – otherwise known as ‘man bites dog’), cute animals, deviance and differing from the norm, things that make people go ‘Awwwww’ (citing this video of six year old kid with cerebral palsy walking to his U.S. Marine father for the first time) and humour. On the surface this list sounded chilling (cute animals?!). But on reflection I realised it is not all that different from the practices of mainstream newsrooms in the past (or at least tabloid ones). The 1997 film, Wag the Dog, plays on this fact. At the end of the four and a half our seminar in Sydney an audience member asked the assembled panel, ‘Are we still in the business of publishing?’ No-one said yes. Da Silva stepped forward first, ‘We’re in the middle of the shake-up,’ he said. For information on the Melbourne session visit the AIMIA website.